1. Embroidery bookmarks are for you to insert in the page of the book you read. 1. One package is includes three pieces. 2. Dimensions: 8.5 x 15cm. 3. Felt & Twill with 60% and 100% embroidered. 5. 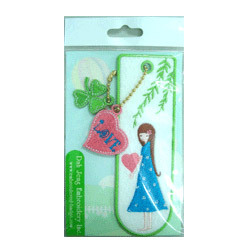 Can produce the embroidery bookmark based on your ownlogo/design, you may decide the colors, size, etc.